This is a wonderful 76-key Virtual Analog Synthesizer. This keyboard has a large touchscreen for easy control and it comes with 3 separately-programmable sound chains. It features Roland's D-Beam infrared controller that lets you shape sounds with the wave of your hand. Tons of features and you can record directly to a USB flash drive for when you have the perfect creative piece that you want to hear now. This keyboard is perfect for use in the studio or live. It retails for around $3500.00. 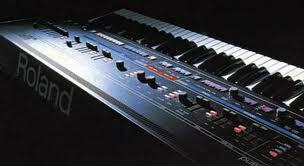 For more info visit Roland here.